One of my goals, when I switched over to a ketogenic way of eating (woe) was to build up a repertoire of simple, basic recipes that I turn to over and over again that taste delicious. Keto Basics recipes are complete in the macros that I'm looking for. For me, that's about 65% fat, 20% protein, and 15% healthy carbohydrates derived from vegetable sources. If you're using my meal planning program, keep these Keto Basics Recipes in your Customizable Recipe Index to keep your meal planning & prep super quick. I'm eating ketogenic in order to heal and balance my body chemistry, lower blood sugar, regulate my hormones naturally, and increase my energy. So, it makes sense that I want to eat the grass-fed and finished beef. It contains so much more nutrients because it comes from cattle who are allowed to eat grass, as nature intended, not grain. If I know grain isn't great for my health, then I certainly don't want to eat beef that is fed grain either. This makes the added expense worth it to me, but I always say just do what you can. It helps to stock up when it's on sale and keep it in your freezer. 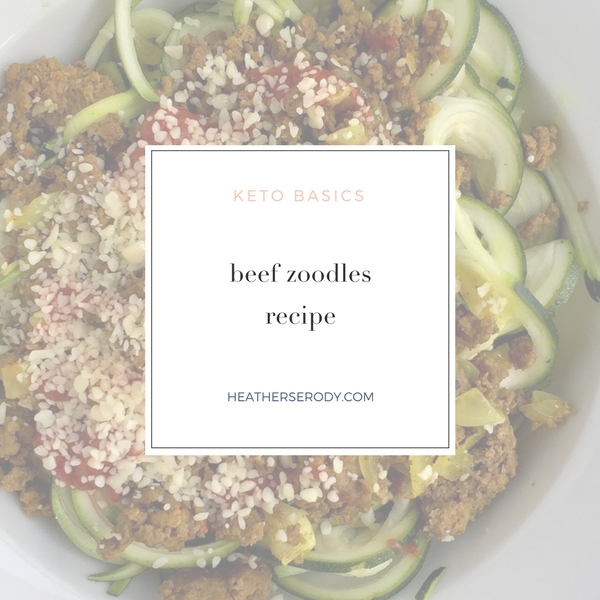 This keto beef zoodles recipe is simple to throw together and makes enough for two meals. I love how adding some apple cider vinegar to the finished beef mixture brings a yummy tang to it, and that its got superfood turmeric added. Since I'm too lazy to make a separate marinara, I just add my favorite sugar-free ketchup on top to make the whole thing taste like a yummy deconstructed burger. Get yourself a spiralizer for this recipe, it's a must-have if you're trying to eat healthier. My number one go-to keto meal. Add onion, beef, turmeric, salt, pepper and saute, stirring often until beef is no longer pink. Once the beef is cooked, sprinkle apple cider vinegar over to your taste. This gives the beef mixture the tangy taste of burger with pickles. Stir well, and then remove from heat. Top zoodles with the beef mixture, add ketchup to taste, and sprinkle with parmesan cheese over top.